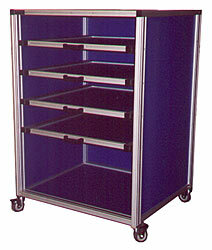 All of our Aluminum T-Slotted Cabinets are Designed with Factory and Industrial Production Concerns in Mind. Distribute Industrial Production Equipment at the Point of Use. 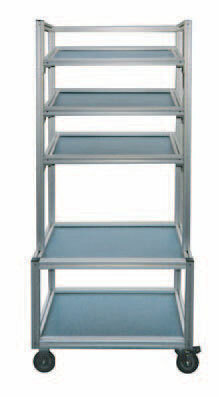 Variety of 6mm, (1/4") thick panel materials, are secured into T-slotted profiles with vinyl gasket. Trespa® panels in a variety of colors to select from. Product based on thermosetting resins, reinforced with cellulose fibers. The surface has elastic properties providing extremely high impact resistance.